-An excerpt from His Holiness’ book Contemplations on the Resurrection. The angels proclaimed the news of Christ’s resurrection to the women saying, “Why do you seek the living among the dead? He is not here, but He is risen” (Luke 24: 5-6) The news of the risen Christ brought tremendous joy to the disciples, but terrified the Jewish leaders. As much as the day of the crucifixion was painful emotionally, it was a day of salvation. However, people did not see Christ opening the doors of paradise, they only saw the suffering, insults and nails. As much as the disciples were disturbed and sad on Friday, they were very joyful on Sunday. The promise of the Lord to them was fulfilled when He said, “But I will see you again and your hearts will rejoice, and no one will take your joy away from you” (John 16:22). Through His resurrection, they rejoiced that the resurrection is possible and realistic. He was the evidence. That is why St. John describes Him, “whom we have seen with our eyes and touched with our hands” (1Jn 1: 1). St. Peter also bears witness that “we have eaten and drank with Him after His resurrection from the dead.” (Acts 10: 41). Through the resurrection, the fear of the disciples was turned into courage and indifference to all the powers that were fighting them. All their enemies could do is threaten to kill them, but what can the threat of death do to one who believes in the resurrection and has seen it! In the resurrection, the disciples felt that they were under the wings of a powerful God. The One in whom they believe holds the keys to life and death. He is the resurrection and the life. He is the source of life, not only on earth. but eternal life also. The disciples rejoiced because God fulfilled His promise to them, when they saw the promise of His resurrection fulfilled, they were reassured of the outcome of all the other promises, like “I go to prepare a place for you… and I will come again and take genericclomid.net you, so that where I am, there you will be also” Jn. 14: 2-3). They believed His promise that He is with us until the end of days (Matt. 28:20). Thus, all His promises gave them power, comfort and joy. Through the resurrection, the cross became a glorious crown, instead of a symbol of suffering. That is why St. Paul says, “I rejoice ‘in weaknesses and insults and persecutions for Christ’s sake” (2 Cor. 12: 10). He also says, “we suffer with Him, so we can be glorified with Him also” (Rom. 8:17). The resurrection of Christ gave believers hope for an afterlife and for an eternal fellowship with Christ. This hope enabled them to put all their treasures in heaven and live as strangers in this world. St. Paul described life in heaven as “what no eye has seen, nor ear heard, nor entered the mind of man, what God has prepared for those who love Him” (I Cor. 2:9). 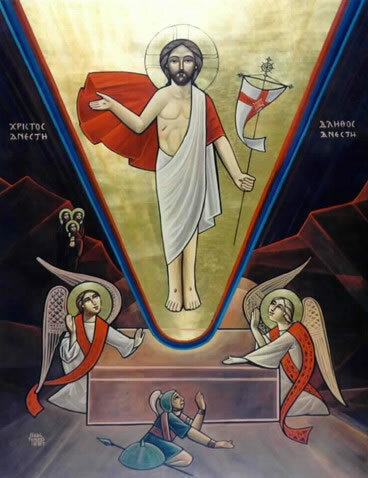 The resurrection, then, is not an end in itself, but a means to the end which is everlasting life with God. The disciples rejoiced for the heavenly body that comes with the resurrection. Christ will raise our bodies also as He Himself rose. Human nature will be glorified in the resurrection from death. St. Paul says that “the body which is sown in corruption will rise in incorruption, and that which is sown in weakness will be raised in power” (I Cor. 15:42-44). He also said that the Lord will change the body of humility into the image of His glorious body (Philippians 3 :21). The disciples rejoiced because, in the resurrection, Christ revisited them. Christ spent a period of forty days with them, healing their wounds and doubts and forgiving their weaknesses. It was a period to prepare them for the upcoming mission. The resurrection gave the Christian mission faith and confidence. Confidence in the risen Christ whose disciples lived with Him for forty days after the resurrection, showing Himself to them with many proofs and talking to them about matters of the kingdom of God. The disciples rejoiced when they saw the Lord and their joy became a way of life for them and Christians after them.